Having stayed at the Villa Capanne in 2014 and fallen in love with the refined rusticity of their accommodation, Alan, Susan and their guests were certainly in for a treat in 2015 when they returned to Umbria for a second Reedart Italian Painting Holiday, this time in the newly-renovated Chiesa Del Carmine: a stunning, no-expense-spared ancient church and adjoining farmhouse nestled deep in the heart of a picturesque valley. Far enough from civilisation to sit and enjoy the silence of the unspoilt Italian countryside, but close enough to the spectacular Robert Trent Jones Championship golf course at the Antognolla Golf Estate and nearby hilltop towns, Chiesa Del Carmine was the perfect spot for Reedart Holidays to settle into. 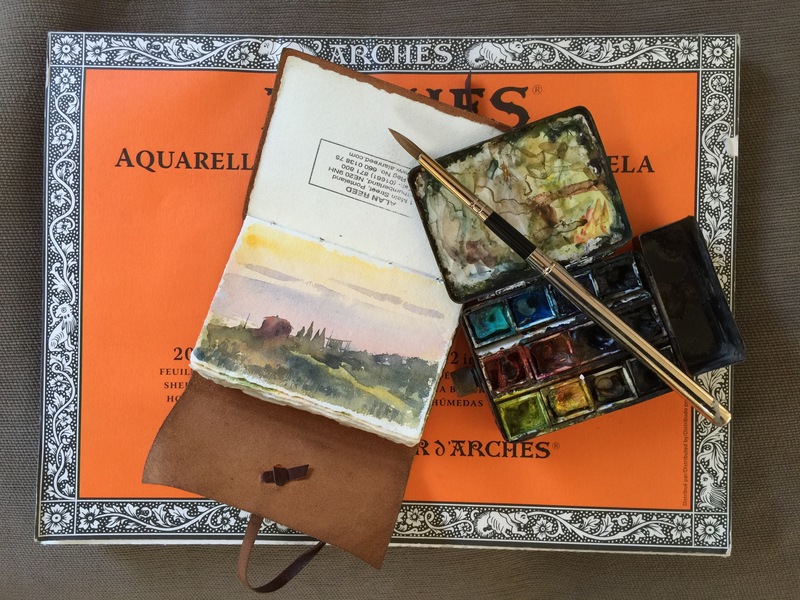 There were trips aplenty on this Reedart Italian Painting Holiday too – stopping off to sketch at Todi, enjoying lunch alfresco in Gubbio and browsing the market at Umbertide and buying cheese, ham and souvenirs to take home. As always, there was a good mix of guests who were here to paint – from beginners and hobby painters – to the more advanced and those who were simply here to eat, drink and explore some of Italy’s hidden gems thanks to Alan and Susan’s unrivalled knowledge of the area. The group had the added bonus of fellow guest Leon’s piano playing skills this year, who often took himself over to the baby grand piano in the lounge in the evening. It was a magical moment which made the holiday even more memorable for those who had come along to paint, and those who had not. This particular trip was a memorable one for two guests in particular – with Arthur’s special birthday approaching, his wife Diana commissioned Alan to paint a portrait of her husband. It was to be a surprise so she asked Alan if he could work from photographs. He could, but if possible it would be better try and do a sketch of him and take his own photographs. So Alan devised a cunning plan. On the last evening of the holiday, he began to sketch various guests after dinner as they were all relaxing in the living room of Chiesa Del Carmine. Eventually it was Arthur’s turn and he willingly obliged to sit without suspecting that Alan’s humble charcoal sketch would develop into a 20″ x 16″ portrait in oils! Arthur was delighted with the result…. For those who would be painting, the owner of Chiesa Del Carmine light-heartedly offered €250 to the best painting of the villa and left it up to Alan to judge the worthy winner at the end of the trip. Thanks to Alan’s expert guidance and tuition over the past seven days, the guests’ painting skills had undeniably come on leaps and bounds and so the eventual winner proved to be a difficult choice for Alan. The winner was John Chapman, whose painting of Chiesa Del Carmine hangs proudly in the venue today. Seven fun, inspiring, adventure-filled days exploring Italy, roaming from sea to city to countryside and sampling some of the finest food and drink left the guests of Reedart Italian Painting Holidays heading home feeling fantastic. Many were struck by how incredible value for money the holiday was – food, drink, travel and accommodation was all included in one price for the entire week. They had journeyed to some unforgettable places, enjoyed some magical moments and really bonded with their hosts – so much so that when Alan and Susan mentioned they were heading to Florence for a couple of nights before flying home all of their guests who flew out with them from Newcastle asked if they could come too! Susan scoured the internet for suitable accommodation, found apartments for everyone in a convenient spot near Ponte Vecchio as well as places for them all to eat and drink together. It was a perfectly unexpected ending to a perfect trip. Due to their popularity, Reedart Italian Painting Holidays became a fully-fledged arm of their 31 year old family business. 21st – 28th MAY 2016 – Fully Booked. It was the 17th of November 2005, two days before Alan would launch his very first overseas exhibition in Italy and here they were, sitting beneath a number of promotional posters advertising the exhibition to the locals of Marostica in Italy’s Veneto region. “The Light” was a long a time coming considering how much time artist Alan and his wife Susan had spent gathering reference around Italy for his ever-expanding popular collection of Italian paintings and unlike the ancient oil paintings that tourists and locals alike were used to seeing hung in galleries, or the fly-by-night souvenir paintings sold for pennies at local markets – Alan’s lively, unique watercolour paintings of some of Italy’s most loved locations and some hidden gems proved popular with the Italians. Carefully loading around 40 paintings onto a private courier, Alan, Susan and their parents flew to Bergamo to meet them, joined by friend’s Loretta, Hilary, Carrol and Franco, Cath and Mike. Much of their first day in Marostica was spent hanging paintings with the help of Alan’s father. Within the town of Marostica there are two medieval castles, an upper Castle known as Castello Superiore and a lower castle known as Castello Inferiore. In front of the old Castello Inferiore and its ancient library is a prominent chess board. Every even year during the month of September a game of chess is played using live pieces. The custom began after the First World War where members of the local chess club began playing chess in the main square and decided to play a game of chess using people as the game pieces. After the Second World War, comedy writer Mario Mirko Vucetich wrote a play in which two noblemen fell in love with the beautiful daughter of a local lord. They challenged each other to a duel to win the hand of their beloved – only to be stopped by the Lord of Marostica who did not wish to see them duel and so forbade the encounter. Instead, it was decreed that the two rivals would play a game of chess and the winner would win his daughter’s hand in marriage and the loser would marry her younger sister. With such a rich history and artistic background, the lower castle was a popular place to host events and exhibitions and so with the help of publisher and exhibition curator Alberto Brazzale whom they had met in Rome not long ago the space was booked to run from the 19th of November 2005 until the 6th of December. The Commune di Marostica were too incredibly helpful to the couple promoting and facilitating the exhibition – one lady in particular named Francesca did an excellent job of promoting The Light on Alan and Susan’s behalf whilst they were back in England running the busy Alan Reed art gallery in Ponteland. Although Marostica was not on the tourist track, the couple’s friends Paul and his wife lived nearby and they fell in love with the area. Sending across images of his work to Alberto across to Italy via CD (it was 2005 after all!) the exhibition began to come together. The couple vividly remember how they rose early each morning with eager anticipation to introduce Alan Reed Art to a new audience. Alan was to be interviewed by respected art critic Signora Maria Lucia Ferugatti on the afternoon of the 18th, the day before the exhibition opened. Signora Ferugatti was impressed and wrote rave reviews about the exhibition for the local paper and regional news. The opening date passed by in a wonderful blur of opening speeches, chatting to locals and listening to their stories about the history of the town, followed by a very welcome visit the next day by their dear friend Nai who had travelled by train all the way from Venice to Marostica to be there. Lovers of Italy’s slow food movement, the group enjoyed a number of fantastic meals whilst in Marostica, and to this day Susan still recreates the divine polpette meatballs they ate at Osteria Madonnetta. The exhibition was without doubt a high point in Alan’s career. Now a fully-fledged international artist, light remains an incredibly important theme that weaves throughout his work. 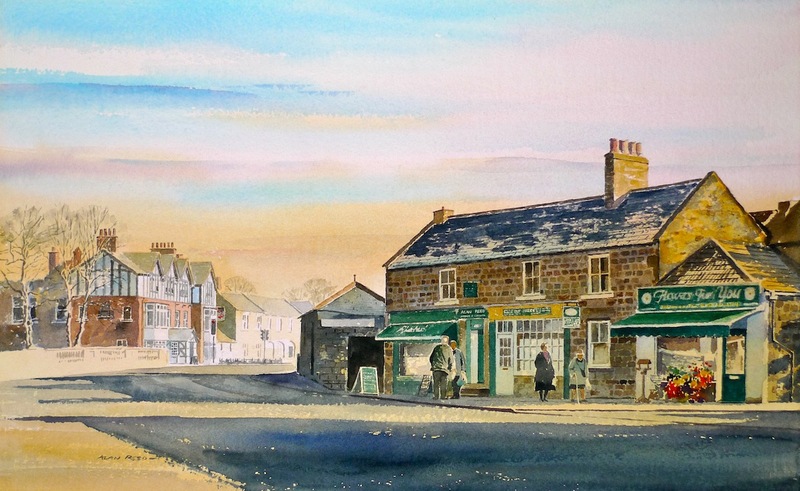 From painting against fading light “on location”, to establishing a light source in the painting and creating highlights, contrasts and shadows using watercolour to bring the painting to life. Returning to Marostica on the 2nd of December, Alan did a series of live painting demonstrations at the exhibition which delighted visitors. Crediting the whole event as a stimulating and thoroughly enjoyable experience getting to chat to the locals in Italian and introduce Alan’s work to them, there was just enough time to enjoy a wonderful supper at their hotel restaurant, Due Mori where they had been upgraded to a room that overlooked the castello beyond and also to their indispensable assistant Francesca’s family home for a home cooked meal. Alan Reed Art was moving in the right direction – and fast. Selling several originals, The Light was a collection of Alan’s paintings of Italy, London, Edinburgh and even Chicago and all showcased his lively style of working with watercolours to create light and darkness in his paintings. Leaving Marostica on the 6th of December after taking the exhibition down, there was just enough time to relax and soak up the scenery – including one particularly lovely scene of ice skaters on the piazza. Begging Alan to capture the scene for a future Christmas card, Skaters in Marostica later became one of Alan’s most popular Christmas card designs, and now you know the story of how and where it all began. Touching down in the beautiful Côte d’Azur, Nice in March 2005, Alan and Susan picked up a hire car and headed an hour’s drive away across the borders to Liguria – also known as Italy’s Riviera for a week-long trip of research and getting reference. The couple had booked a space at the hugely popular La Dolce Vita event in London (a three day event hosted by Italy magazine aimed at promoting all things Italian) later in the spring, so their trip to Liguria would be a fantastic research opportunity for Alan to sketch and add to his collection of Italian paintings which he would be showcasing at the La Dolce Vita event. Despite its reputation as a jewel in Italy’s coastline, Alan and Susan arrived in Liguria on a dull, grey rainy day. They had decided to book a hotel once they arrived, giving them more freedom and scope to explore the area but with the weather being so bad they decided to drive to their next destination and see whether they could check in at their hotel a few days early. As luck would have it, heading straight to Alba turned out to be the best decision they could have made… Stopping for directions on the way, Alan and Susan were told “you will eat well” in Alba, and they certainly did! Alba is known for its slow food movement – no fast food culture grows here, but instead an appreciation for seasonal, organic local produce. As Alan and Susan would discover, there were no menus in Alba’s Osterias. Instead, you were served what was seasonal and fresh that day – like pizza topped with deliciously soft stracchino cheese which is unavailable to buy in England due to its quick sell-by-date. The couple still vividly remember one favourite Osteria Sognatori in Alba where they were treated like old friends and served a culinary feast of antipasti, salami, cheese, pasta and ravioli to start, before moving on to a main of meat and fresh vegetables served with local wine. Finishing their meal with coffee and the customary grappa, Alan and Susan were amazed to find the whole meal at Osteria Sognatori cost just €45. Alan and Susan spent the remainder of the trip in the Piedmont region of Italy driving to nearby hilltop towns of Bra, La Morra, Neive, Mango and Nebbiolo, stopping to visit their hotel owner’s vineyard in Barolo in between and sampling some fantastic local produce to bring back home. Picking up salami and cheeses at various other stops on their trip, Alan and Susan were taken aback by the beautiful scenery in the Piedmont region. Six days of adventure passed all too quickly and it was time to head to the airport via Liguria and Monte Carlo – but not before Susan stopped a local fisherman to ask where they might find the best seafood restaurant in Noli, Liguria to enjoy one last fantastic meal here. 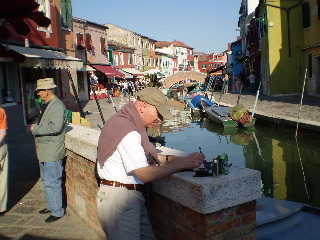 With a sketchbook full of reference of vineyards, street scenes, rich Italian landscapes and a head full of memories of bustling streets lined with wine bars and friendly locals who “never get English people here” – Alba was not yet on the tourist radar, but Italy enthusiasts Alan and Susan had certainly discovered a true hidden gem. Fast forward from March to September 2005 and Alan and Susan were packing their bags for Italy once again. Thanks to an influx of incredibly cheap Ryanair flights during this time, there was no excuse not to, and so the couple booked to stay at La Mason, a complex of apartments near Verona. Landing in Bergamo, they headed for the Veneto along the motorway following La Serenissima, once an ancient trade route between Venice and Milan. They spent 7 days exploring the area. Travelling off the beaten tourist track, Alan and Susan also discovered one of the most incredible seafood restaurants they had ever eaten at. Said to be a favourite of one of the famous Formula 1 champions, they were in good company as they dined at Il Tenere where the owner, an enormous hulk of a man sat down in front of them and asked them what they wanted. Instead of being presented with menus, they were treated to an incredible meal of fresh fish and local wine. 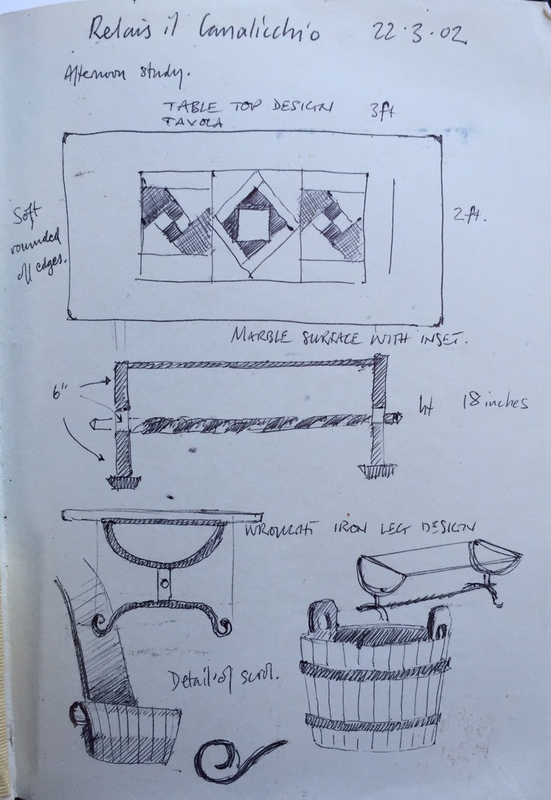 Such is the life of an international artist, Alan visited the historic towns of Marostica, Asolo, Asiago, Padua and Vicenza on this particular research trip. Providing him with an abundance of reference for a forthcoming exhibition, the trip was also a perfect opportunity to meet up with their old pastor Paul in Marostica and Alberto Brazzale, the publisher whom they had met a year earlier in Rome. Working on location, often battling against quickly fading light conditions gave Alan’s work a painterly sense of immediacy and energy. 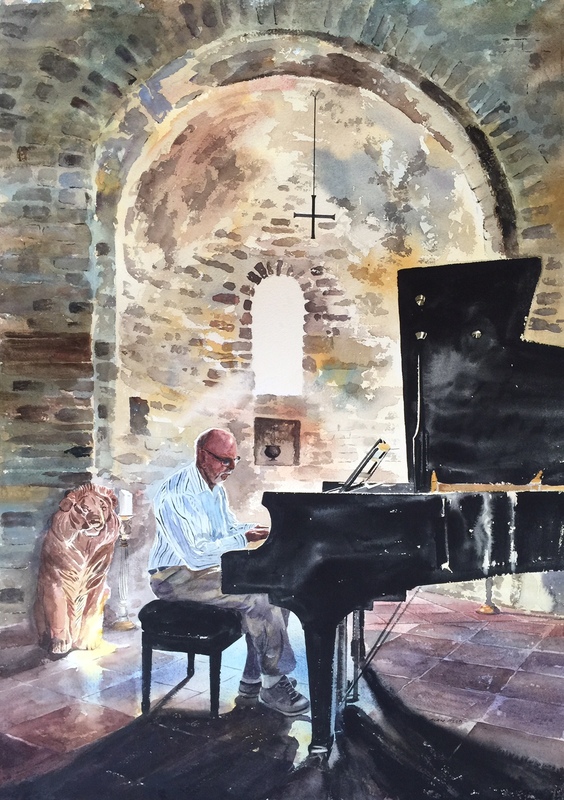 Painting directly with his paintbrush using watercolours rather than pencil or charcoal gives Alan’s work a truly distinctive style enjoyed the world over – from their gallery in Ponteland to London’s La Dolce Vita and even at the airport in Italy! After a chance meeting in local pub The Diamond in Ponteland, family members and friends could scarcely have predicted the adventures in store for Alan and Susan who married three years later. Having recently returned home from living abroad in Venice with her two young children and settling back into life in the North East, Susan longed to show Alan the sights, sounds and smells of her beloved Venice and introduce him to some of the lifelong friends the family made there. It was June 1991 when the couple finally took that much-talked about trip. This would be Alan’s first trip to Venice and armed with little else than a conversation he’d had with an old colleague about the architecture and stories he’d read about this iconic city, it became one of the most memorable trips of the couple’s lifetime and the couple returned to Venice in August 1994 where Alan painted 14 “en plein air” watercolours which were part of the “A Tale of two Cities” exhibition in the Spring of 1995. While Alan’s family had strong Christian roots, Susan’s rebirth as a Christian was borne in St Mark’s Church whilst living in Venice, and a visit to this magnificent church tied the couple even closer together as Susan shared this chapter of her life with him. Introducing Alan to the friends and “family” Susan made whilst there, Alan quickly found himself falling in love with the Italian way of life. A true home from home for Susan, she happily wandered around the shops with the children, buying handmade sketchbooks and exploring the little back streets and lesser known piazzas whilst Alan painted the joys of Venice – soaking up every inch of the Grand Canal, the view from the vaporetti (the water buses of Venice) and everything in between. It was undoubtedly the beginning of something special, especially for Alan who compares their trip to Venice “like being on a stage set”. The pinch-me moment came when the week all-too-quickly drew to a close and Alan found himself overcome with emotion, already planning his next trip to the city that had stolen his heart after only a week. “I’ll definitely be back”, he thought and he was right. Venice, and indeed Italy has been a constant source of inspiration for Alan’s artwork throughout his career, his works of Venice have been featured in art galleries and various art books over the years – but none can compare to the feeling of pure excitement and exhilaration the young family felt as took their first trip together to a place filled with so many memories – giving Alan a wonderful sensory insight to the wonders of Venice that he in turn shares with us all through his artwork. Venice is magnificent any time of the year, beautifully hot in the summer months before turning icy cold in winter. The sight of everyone wrapped up in their furs and the frost dazzling on the canal is unforgettable – while the iconic Venice Carnival which takes place in February is a must not miss. Where to Go: Head to the Castello neighbourhood of Venice and you will find the “Giardini” (gardens) where is nice to wander in the shade to cool off. We often took the boat over to the Lido to sunbathe on the beach. I would make a large container full of home made lemonade to take with us to drink throughout the day, it was so refreshing made with about a dozen fresh lemons. Where to Eat: An unusual restaurant in the Jewish part of Venice was Gam Gam which serves fantastic tasty food and very reasonably priced. We also highly recommend Osteria Enoteca near San Marco and Antico Forno, near Rialto for a nice pizza. Try Al Covo Restaurant and Osteria all’Alba near Rialto for cocktails. Follow this link to view all of Alan’s Venetian paintings currently available for sale. 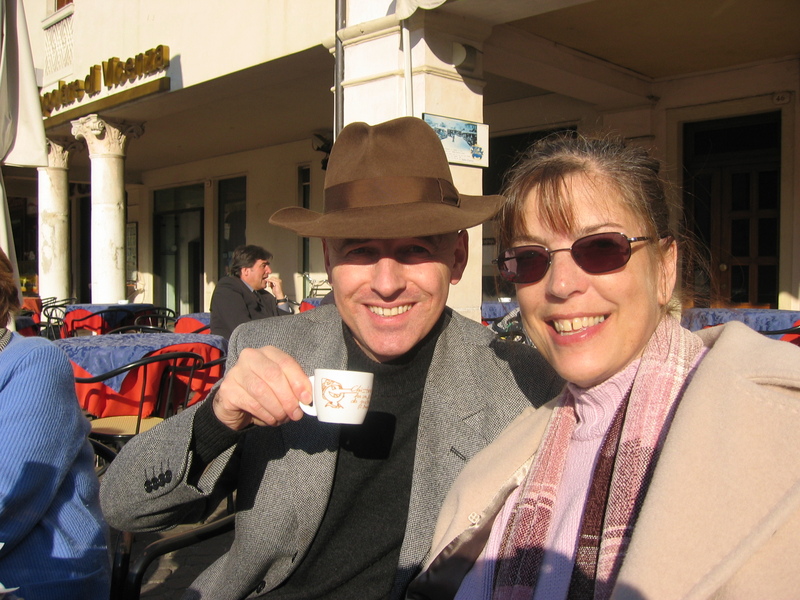 Our first trip to to the region Umbria in Italy was in 2002. 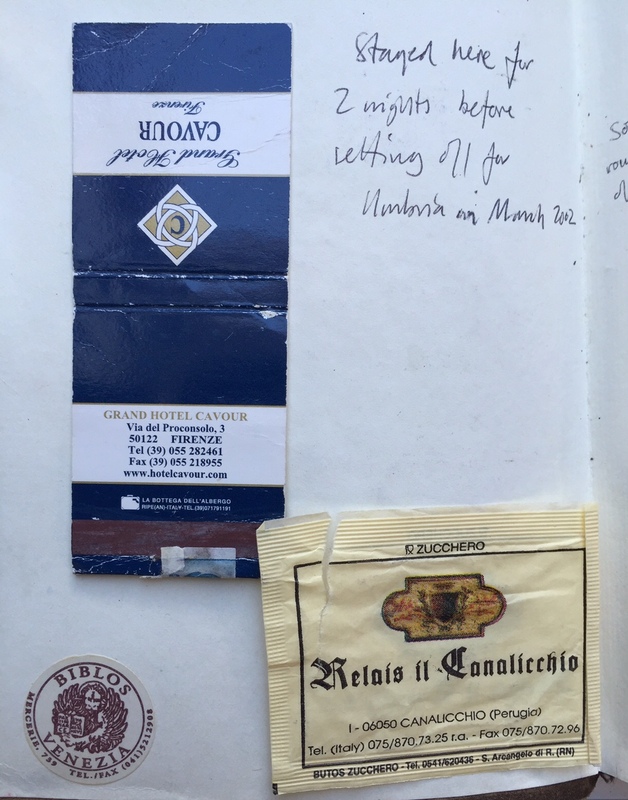 We stayed at the Relais il Canalicchio which boasts commanding views over the Umbrian countryside. On one of our trips out to explore we visited the Fabriano paper factory where I purchased several leather bound sketchbooks containing their beautiful hand made paper which is a delight to paint on. In fact these tiny sketchbooks are so lovely you initially feel a little scared to paint in them in case you mess it up! 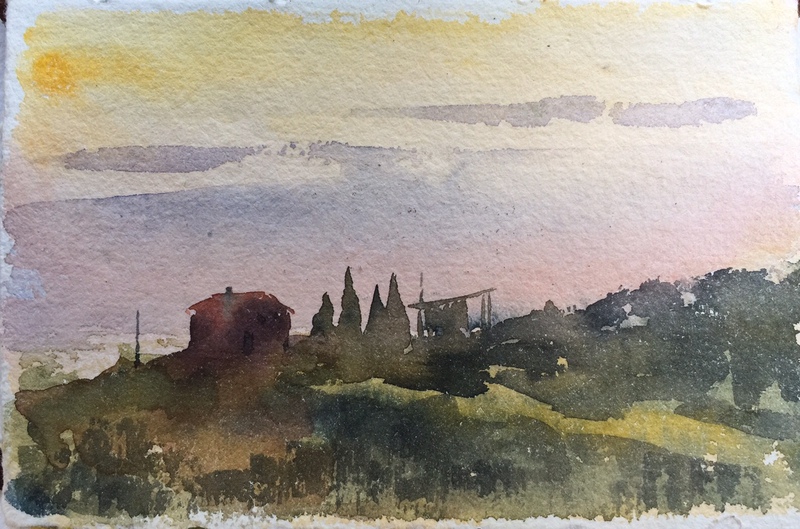 I did pluck up the courage though and one evening I painted the view from out window, a simple composition of a small farm building silhouetted against the warmth of the spring evening light. These are the kind of subjects that I would be encouraging guests on our painting holidays in Italy to paint. I would be leading by example but also overseeing their work, deciding on the right composition, advising on choice of colours, sequence of washes and of course making sure that they don’t spoil the painting by overworking it. Nowadays there are some excellent sketchbooks available in the UK and online containing good quality paper to paint on. I also recommend the Arches watercolour blocks for slightly larger paintings. A 14″ x 10″ or 12″ x 9″ containing rough paper which is small enough to pop into a bag with the rest of your painting gear. I usually have a range of materials available from my Studio & Gallery in Ponteland, Northumberland. The venue this year was the recently restored church Chiesa del Carmine, a building that was in ruins when Alan first painted it on location in 2004. We never dreamed that one day we would have the privilege of staying in, what is now, a beautifully restored building with breathtaking views and landscaped gardens. The accommodation itself is stunning and is the perfect place to chill out and relax. There are plenty of subjects to paint in and around the property (which we did) but we also enjoyed a couple of day trips out and about. The first was the small hilltop town Todi, just south of Perugia in Umbria. We based ourselves in the piazza. Alan and the painting guests sketched the architecture in watercolour before enjoying a delicious pizza at a nearby restaurant.